Our makerspace can be broadly divided into two areas: “dirty” and “clean.” The dirty area is where you do things that make dust, chaff, fumes or sparks. It's where you paint stuff. It's where you saw, grind, drill, weld and sand. The clean area is where you don't make or want that sort of contamination. 3-D printing, electronics assembly/disassembly and soldering are the types of activities you'd conduct in the clean area. As any recent visitor will attest, the layout that resulted after our move was not thought out. We were more concerned with getting our stuff unloaded and confined within our area. The result was less than optimal, to say the least. For example, our two 4' x 4' work tables were shoved into a corner. It was next to impossible to make full use of them. We had stuff taking up space that needed to be moved upstairs to the mini-Mendelson's area. And we have some minor electrical wiring to be performed. So last week I moved the big items upstairs. 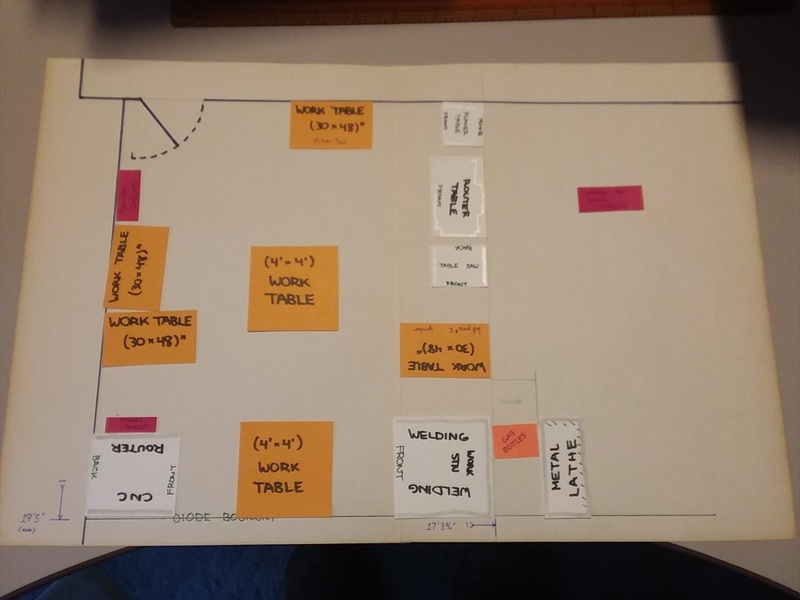 And I spent the past week-and-a-half working on a layout that makes better use of the square footage we have, focusing primarily on the dirty area. A wide open area within our boundary is a luxury we cannot afford, nor do we need to. At the Milburn building we had an area roughly 30' x 30' for about 2/3rds of our tools and machines. Here we have to fit all of our metal and wood working equipment into a space roughly 2/3rds smaller. But we can utilize the common open areas within the K-12 shop space to work on projects, so we don't need a wide-open area within ours. The picture shows the new dirty area layout. This Monday through Thursday I'll finish moving all the equipment and fixtures to their places and tidy things up. I should be able to get 220 VAC service set up for the welding station during this time. Providing 120 VAC service to the west side of the dirty area will require a bit more work which I'll tackle after next Saturday.